Kosciuszko Circle: Even on a 'good' day, the rotary at the northern end of Morrissey Boulevard is a challenge for motorists, bicyclists and pedestrians. Griffin Connolly photoThe long-sought project to reconstruct Morrissey Boulevard remains under way, if slightly behind schedule for presenting potential designs to the community, Department of Conservation and Recreation (DCR) officials said this week. 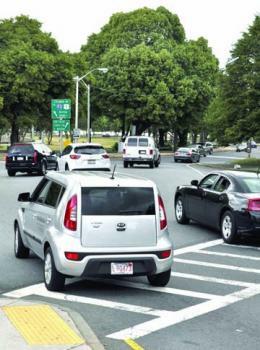 Residents and elected officials have been clamoring for updates to the state road, which is slotted for redesign from Kosciuszko Circle south to Neponset Circle. The revamp is fully funded through the $3.5 million design phase, with the cost of the complete overhaul pegged at $40 million. Although a public presentation of designs was planned for May, the DCR now plans to hold the session in late summer when design proposals for the entire length of the parkway will be presented. A public comment period would follow. In recent years, high-profile building developments and proposals have heightened community concerns about traffic along the Morrissey corridor and its side streets. Studies included in a DCR presentation on the project identified the heaviest traffic congestion sites as Freeport Street and UMass Boston at Mt. Vernon Street. Recent talk about a soccer stadium being built on the former Bayside Expo Center site have ramped up the fears of traffic overload around Columbia Point and the JFK/UMass T station. The thought of added traffic grinding its way through Kosciuszko Circle has prompted community members to suggest that an overhaul of the rotary is long overdue. But Kosciuszko Circle’s relevance to the ongoing Morrissey project has remained unclear. The rotary, which marks the northern point of the parkway, is a frequently cited source of frustration in public review. The highest priority portion of roadway is the central leg from Bianculli Boulevard at the entrance to the UMass Boston campus south to Freeport Street where flooding across the roadway during stormy weather has been the norm for decades. DCR officials distributed a survey at the first public meeting in late March and also posted it online. Frequent Morrissey Boulevard users were queried about their usual modes of transportation and about what they saw as needing improvement along the busy, often waterlogged road. Over three weeks, 137 drivers, bikers, and pedestrians offered feedback on a road they described as frequently unsafe and unpleasant to traverse. The most frequent pedestrian crossings are at the Savin Hill Yacht Club Signal, Bianculli Boulevard, Freeport Street, and Mount Vernon Street/JFK-UMass Station, according to the survey results. Perhaps most telling of the pedestrian responses was that the question, “As a pedestrian, what sections of Morrissey Boulevard do you feel work well today?” elicited a chorus of “none” submissions. Recommendations for improving pedestrian/bicyclist infrastructure came down most in favor of cycle tracks separated from the roadway and distinct from pedestrian paths, either through different elevations or lane markers. Most bicyclists use Morrissey from the JFK-UMass stop to Bianculli Boulevard to Freeport Street, according to the survey. The majority of respondents (69 percent) said the boulevard is not a good commuting road for cyclists, with many opting to try their luck on Dorchester Avenue instead. Bicyclists overwhelmingly said they would travel more frequently to beaches and parks along Morrissey if the commute were improved and connections increased. According to the survey, drivers chiefly use Morrissey to access regional roadway networks like I-93 or to access businesses along the stretch. Although there was a higher rate of positive feedback from drivers than pedestrians and cyclists, with some noting that the lengths of road between Bianculli Boulevard to Freeport Street and Pope’s Hill Street to Neponset Circle worked well, other respondents pointed out that the overall design of the road left drivers vulnerable. The redesign will draw from the community surveys and annotated maps from the March meeting. With respondents enthusiastically calling for more park space and better access across all manner of transportation, DCR officials are weighing the implementation of set-backs and creative uses of elevations and drainage.